Steven Furtick's desire is to inspire us to pray what he calls "Sun Stand Still" prayers as we pursue God. The phrase comes from the story of Joshua where God makes the sun stand still in the sky in response to Joshua's prayer so that the Israelites will have time to completely defeat their enemy. Furtick believes that if we have audacious faith and pray "sun stand still" prayers, then we will see God do amazing things in, around, and through us for His glory. I have to say that I began reading this book with some skepticism. I think we have all heard or read about how God will move mountains for us if we will just have faith and let God work. 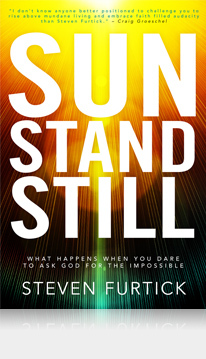 What I appreciate about Sun Stand Still is that Furtick repeatedly brings us back to aligning ourselves with God's character and purposes as revealed in scripture. Really, what this book is advocating is that we live our lives as disciples of Christ in such a way that we actually need faith in God daily. The reality is that way too many professing Christians don't really need faith because we have our lives mapped out and have done a pretty good job of providing for ourselves. We don't really need God all that much on a day to day basis. Sun Stand Still challenges that lifestyle and encourages us to live and dream in such a way that we must rely of God and His faithfulness regularly. We are told in scripture to walk by faith and not by sight and this book challenges us to do just that.